Note: This game was played on a PC Engine home console. The console was connected to 32-inch HD tv with AV cables (red, yellow, white). 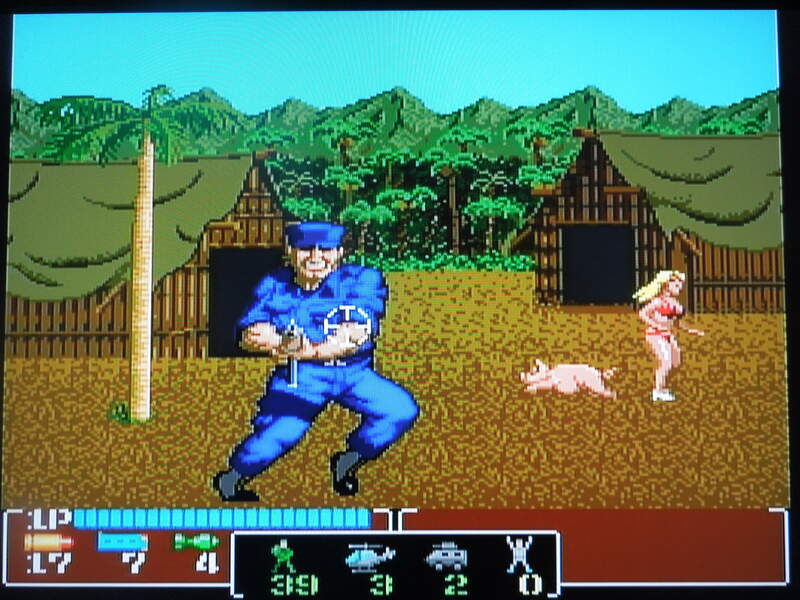 Quick History: Operation Wolf was released for the PC Engine home console exclusively in Japan in 1990. The game is a port of the arcade game released in 1987. 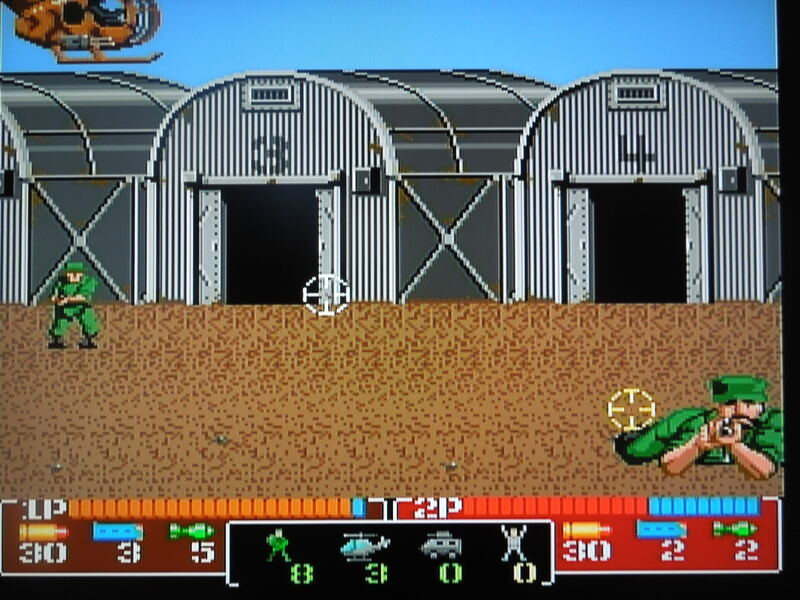 There were several home console versions of Operation Wolf, including the NES. The game was not released in the U.S. for the Turbografx 16 (the U.S. version of the PC Engine), and thus many U.S. gamers are unaware of any version other than the arcade or NES ones. 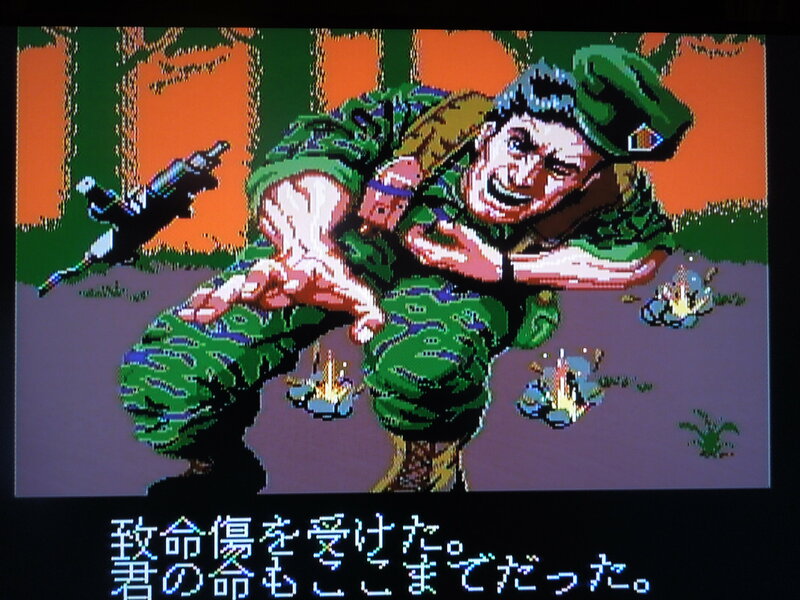 The PC Engine version of Operation Wolf trumps the NES version. Story: You (or you and a partner) are Special Forces Operatives who are charged with rescuing POWs from concentration camps. You’ll need to infiltrate jungles, villages, and military bases and shoot everything in sight to accomplish your objective. Modes: Operation Wolf is a very straight-forward game. The opening screen has options for 1 Player, 2 Players, or Speed. If you select Speed, you can change the speed at which your onscreen crosshair (the little X that shows where your gun is pointed) moves across the screen. You can select from Slow, Normal, and Fast. In my experience, Normal (the default selection) is perfect. You can choose the order of the first 4 missions. Control: Button II fires your machine gun. Button I fires off your rocket launcher. Run pauses the game. The control pad moves your crosshair to every corner of the screen. 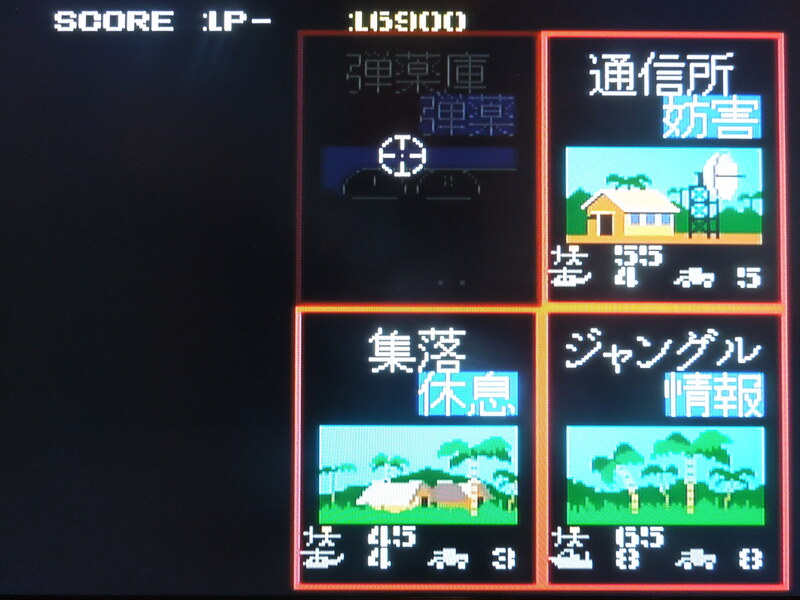 Gameplay: You must shoot your way through 6 missions, all of which aren’t very long, but are filled with action. To start the game, you can select among 4 missions. After you beat each of these, 2 additional missions become available to you. During each stage, your goal is to kill everything on screen while not dying yourself. 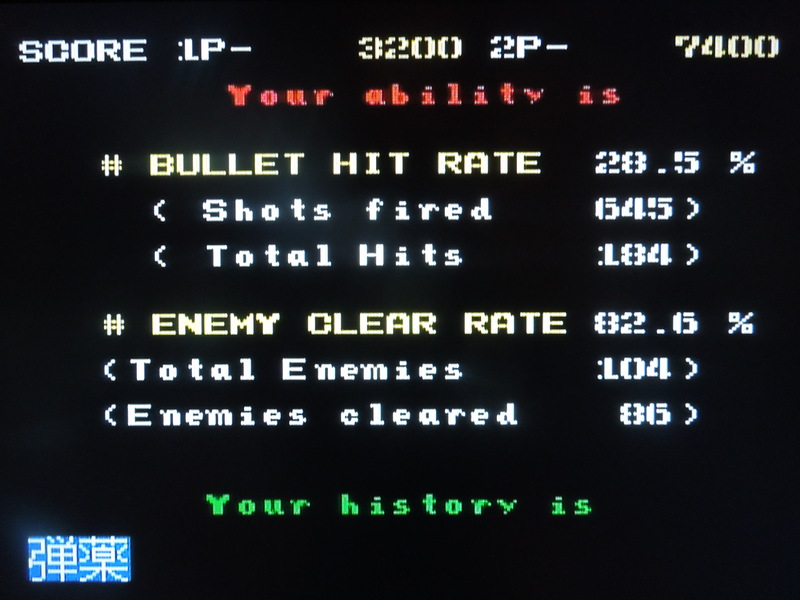 You have a long life bar at the bottom of the screen, and every time you get shot, it depletes. Once it’s empty, the screen displays the words ‘You Dead’ and the mission is over. Soldiers, paratroopers, knife-throwers, grenade lobbers, helicopters, armored cars, and armored boats will all be gunning for you. You have a set amount of ammo for your machine gun and rockets for your rocket launcher, but you can pick up more in each stage. You stats are displayed after you die or after you beat the game. Items: During each stage, you can collect different pickups to help you complete each mission. You have to shoot them to acquire them. Magazines increase the number of bullets you have. Green rockets increase your rockets by 1. ‘P’ drinks increase your health by several bars. ‘FREE’ icons allow you to fire your machine gun for several seconds without losing any ammo. Dynamite icons kill everything onscreen. Occasionally, first aid kids will be parachuted down, and these refill your entire life bar. Sometimes, vultures fly by or coconuts are seen hanging in trees. Shooting these will release a magazine. 2 Player Co-op makes the game easier. Innocents: Prisoners-of-war, women, children, nurses, and even a bikini-clad blonde (seriously) will occasionally run by. Don’t shoot them, or you’ll lose some of your health. Continues: If you lose all of your life during a stage (or both Players lose their life during co-op), you’ll have the option to continue only once. You’ll restart from the beginning of the stage you were on, but your health and ammo will be refilled. If you lose all of your life again, the game is over. Language Barrier? No and Yes. No, not really. The game title and mode selection are in English. After you beat the game, or lose your life, you can view your stats (number of bullets fired, etc. ), which are also in English. The story, however, is in Japanese. 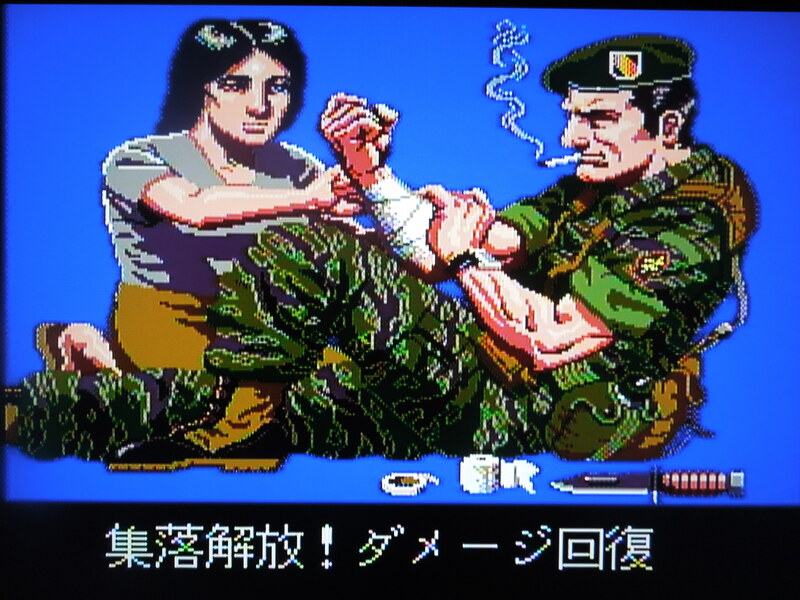 The stage names and onscreen text following completed missions are in Japanese, but it’s not hard to tell what’s going on due to the excellent art accompanying the text. Cut-scenes advance the story between missions, although the text is in Japanese. So, where can I find this game? It’s easy to find on sites like eBay, although you may have to order it from Japan. You can also play the rom on a computer emulator. Conclusion: Operation Wolf for the PC Engine is a surprisingly excellent game. The gunshots and explosions sound great, and the game looks fantastic – much better than the NES version, certainly. The control is excellent, as the crosshair moves exactly where you want it to. There is no option to attach a light gun like in the arcade original, but that doesn’t hurt the game. Having built in turbo controls (like many PC Engine controllers do) really helps in games like this. The challenge is spot on, too. It will take you several playthroughs to decide which stages you should play first, second, etc. based on their difficulty. Two player co-op makes the game somewhat easier, although players have to split the supplies they find, making the conservation of ammo and health pickups even more important. You have exactly 1 Continue, so honing your shooting skills is essential to beating the game. 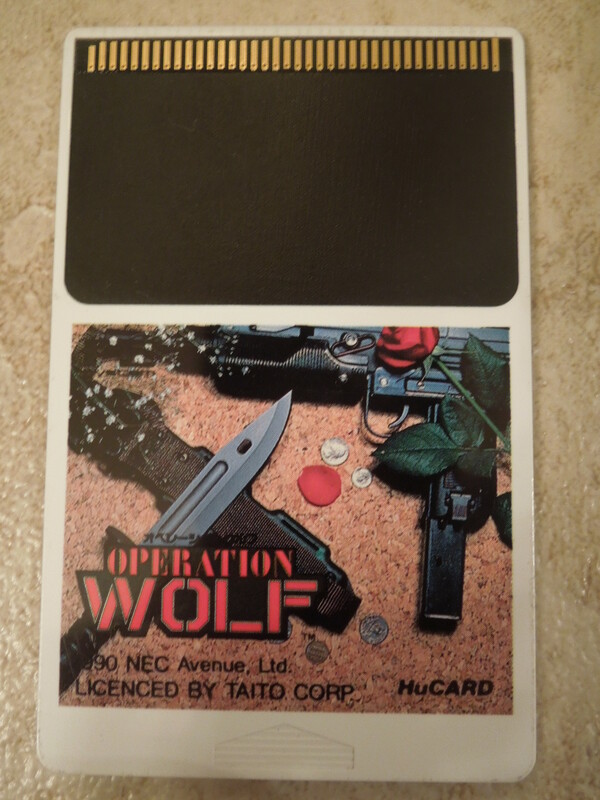 This entry was posted in PC Engine - Operation Wolf and tagged Operation Wolf PC Engine Review. Bookmark the permalink.